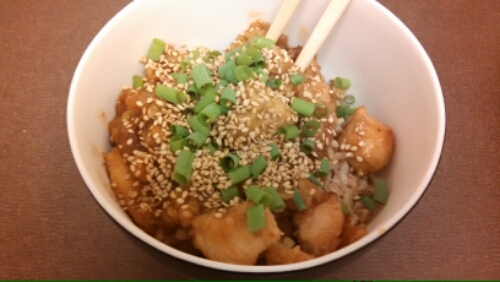 For your Friday afternoon viewing pleasure, I have a super simple orange chicken recipe by Damn Delicious. I have been cooking a TON of stuff from that blog lately – it is so fresh, simple, minimal, and easy! Oh, and not to mention…delicious. This chicken does require some marinade time…I marinated it overnight, but the minimum marinade time is at least 30 minutes. -To make the marinade, whisk together chicken broth, orange juice, sugar, vinegar, soy sauce, garlic, orange zest, Sriracha, ginger and white pepper in a large bowl. -In a gallon size Ziploc bag or large bowl, combine chicken and 2/3 cup of the marinade; marinate for at least 30 minutes (overnight, if you can! ), turning the bag occasionally. Cover and refrigerate the rest of the marinade. -Once you’re ready to cook, drain the chicken from the marinade, discarding the marinade. -Heat remaining marinade in a medium saucepan over medium heat. Bring to a boil and stir in 2 tablespoons cornstarch combined with 2 tablespoons water. Cook, stirring frequently, until thickened about 1-2 minutes, then keep warm. -Dip the chicken into the eggs, then dredge in remaining 1 cup cornstarch, pressing to coat. -Heat vegetable oil in a large saucepan or wok. Add chicken and fry until golden brown and cooked through, about 1-2 minutes. If you’re working in batches, transfer chicken to a paper towel-lined plate, to soak up the excess oil. -Serve chicken immediately, tossed or drizzled with the marinade, garnished with sesame seeds and green onion, if desired.